Pagosa Springs Real Estate sales continued its upward climb in sales for the first quarter of 2011 over the same period in 2010. In my office we are seeing many more buyers inquiring about properties online, coming into our office to look around and closing on properties. Most of our buyers are looking for that fantastic deal which is usually a bank-owned home priced way under replacement value. Below are the most recent stats from the Pagosa Springs Area Association of REALTORS®. Number of homes (all types) sold in the first quarter of 2011 increased over the first quarter of 2010: 60 vs. 49 units respectively, an increase of 22%. Average Selling price in 2011 = $295,367 vs. $298,522 in 2010, down 1%. Foreclosure sales for residential properties in the MLS = 18 in 2011 vs. 13 in 2010, up 38%. Average selling price for those homes =$203,808 in 2011 vs. $258,084 in 2010, down 21%. Single-family home sales in 2011 = 48 vs. 41 in 2010, an increase of 17%. The average sales price in 2011 was $341,530 compared to $330,937, showing a increase of 3%. Median sales price in 2011 was $255,000 compared to $302,000 in 2010, a decrease of 16%. 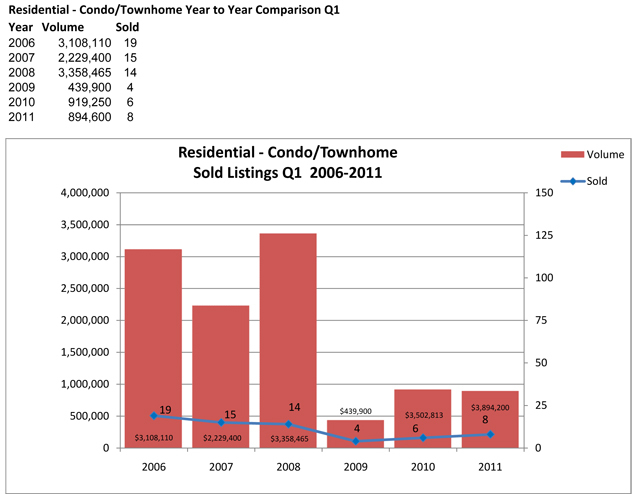 Condo/Townhome sales made an increase (33%) in 2011 from 2010. The average sales price decreased 27% over 2010; but the median price decreased by 36%. For both residential and land (all types), sales were up in 2011 by 21% over 2010. 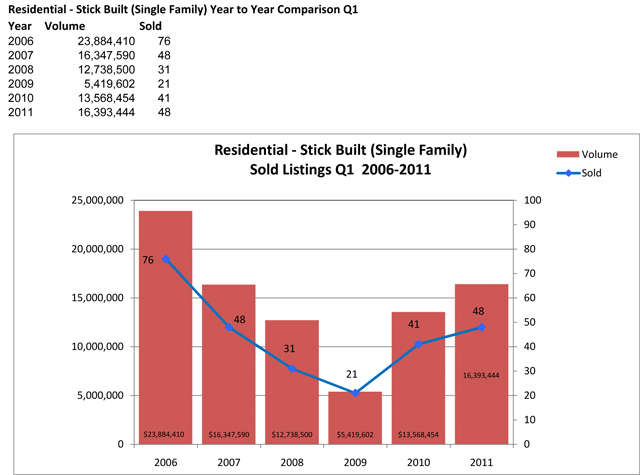 Average sale price in 2011 =$226,894, 2010 = $246,320, down 8%. Median sale price in 2011 = $136,750, 2010 = $193,500, down 29%. 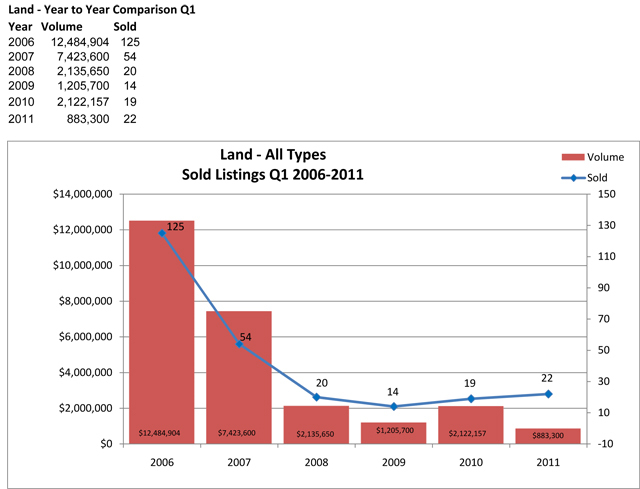 Land (all types) sales = 22 in 2011 vs. 19 in 2010, up 16%. Average 2011 sales price = $40,150 vs. $111,692, down<64%. Median sales price = $23,500 in 2011 vs. $37,000, down 36%. Commercial sales showed 5 in 2011 compared to 4 in 2009, an increase of 25%. The average sale price decreased from $139,725 in 2010 to $79,800 in 2011, down 43%. The median sale price decreased from $69,450 in 2010 to $35,000 in 2011, down 50%. The number of sold properties are up across all property classes for the first quarter of 2011, with average sale prices down except in single-family homes. Single-family home sales are back up to the 2007 level and land sales have increased to above the 2008 level, but with very low prices. As of April 4, 2011, the total active listings for all types of residential properties throughout Archuleta County is 521; down from 562 one year ago. The average list price is $413,320 and the median listed price is $265,000, both down from Q1 of 2010. There are 849 active listings presently in the Land class (all types) compared to 875 in 2010. There are 728 residential Land listings alone with an average list price of $114,130 and median list price of $ $59,900, both down from Q1 of 2010.